Error 500: Filter [SanitizingRequestFilter]: could not be initialized. Copy the sas.portlet.container.runtime.extensions.jar file from the /Lev1/Web/Staging/Exploded/sas.biportlets4.X.ear/lib directory to the WEBSPHERE-HOME/lib directory of the IBM WebSphere Application Server. 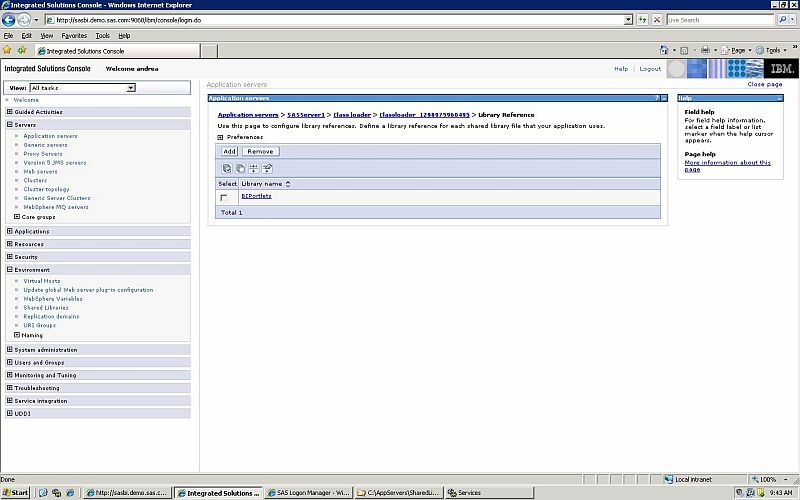 Restart the WebSphere application server. 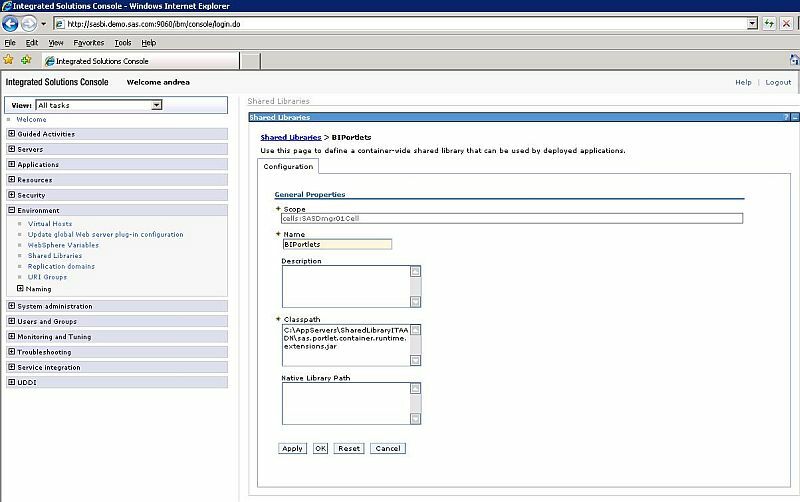 These manual steps are required because of a limitation in the WebSphere application server. In UNIX operating environments, the JAR file must be copied using the same account that is used to install the WebSphere application server. The following steps are an alternative method to resolve the error. The displays that are shown are from WebSphere 6.x, but they also apply to WebSphere 7.x. Copy the sas.portlet.container.runtime.extensions.jar file into a folder similar to C:\AppServers\SharedLibraryITAADN. 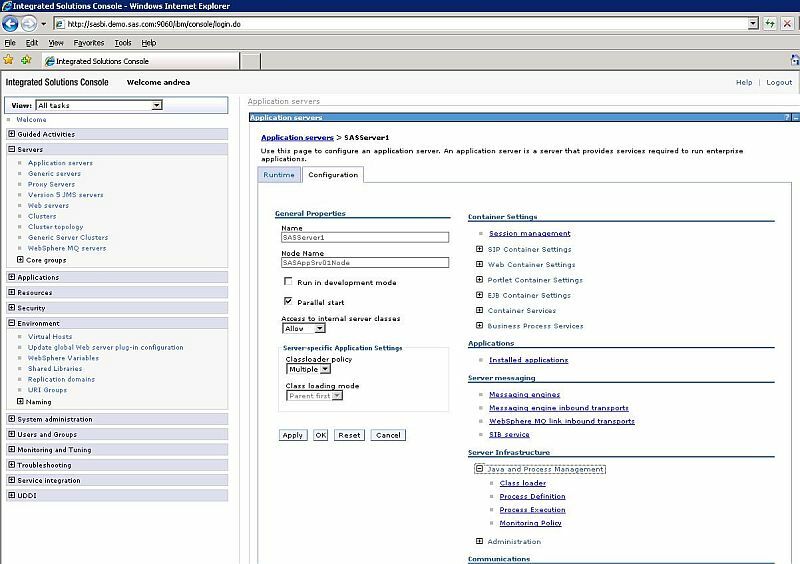 Open the WebSphere console and navigate to Environment and Shared Libraries. Choose the Cell scope (for example, Cell=SASDmgr01Cell). Select Servers ► Application Servers and select SASServer1. In the Server Infrastructure category, expand Java and Process Management. Then, click Class loader. Leave the selection Class loaded with parent class loader first as is. Click the new classloader_xxxxx link. Click the Library Reference link. Click Add and select BIPortlets for Library name. Stop the deployment manager and the node agent. Delete the sas.portlet.container.runtime.extensions.jar file from WebSphere-home-directory/lib if it exists. Restart the deployment manager and node agent. The following error occurs when you validate the SAS BI Portlets: "Error 500: Filter [SanitizingRequestFilter]: could not be initialized."